The ash, Black Poplar and maple trees are starting to turn yellow and harvest is starting in earnest. The Chokecherry (Wild Black Cherry) trees are loaded with fruit to the point that the trees are bent over because of the weight of the berries. At this time of year it is the just about the only fruit available to fruit eating birds. Judging by comments from local residents, chokecherry production was very good everywhere this fall. In our back yard the chokecherries have attracted small family units of Cedar Waxwings and one juvenile Robin that still has not joined a flock of other Robins in preparation for migration. In the fall gardens and orchards also attract hordes of insects which in turn attract the smaller insect eaters such as warblers. 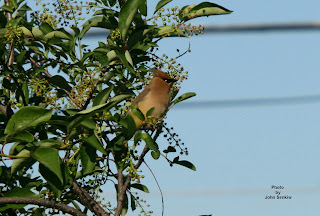 Because of the chokecherries the Cedar Waxwing winds up being the bird of the week as it were. The waxwings belong to a family of fruit eating birds that has only three members in it world wide. One of the three is a resident of Japan; of the remaining two, the Bohemian Waxwing is circumpolar; the last one, the Cedar Waxwing, is a native of North America. 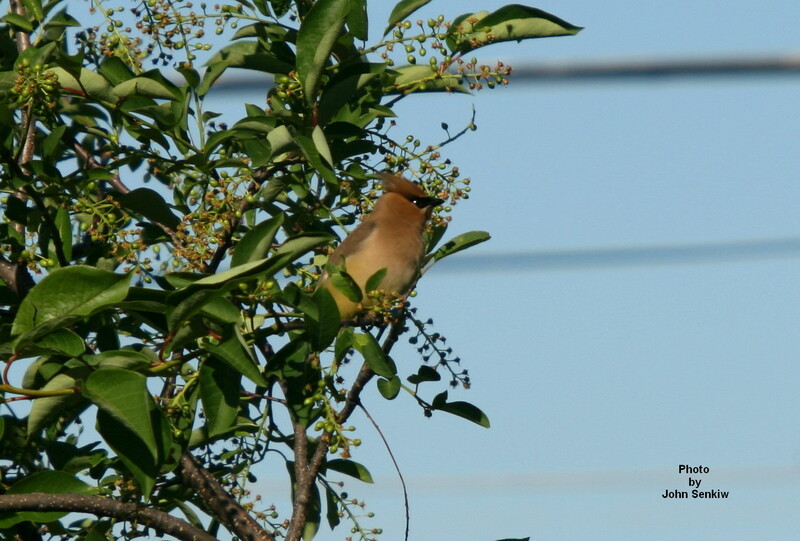 Whereas, the Bohemian Waxwing is a winter resident, the Cedar Waxwing is a summer resident that nests locally. In the fall, family units of Cedar Waxwings move into berry groves to feast on the fresh fruit. They are quite tame and readily come to our yards in towns and cities thus making observation very easy for any birder. Even though the Bohemian and Cedar Waxwings are very similar there is little chance of a mix up as the former is here only in the winter and the latter in the summer. There appears to be no overlap in the spring and fall. In the very southern part of our province and in the northern states the two do occur together in the winter and identification can be a bit of a problem. Although the Cedar Waxwing is one of many small sparrow sized brownish birds, it does stand out and can be readily identified even by a casual observer without the use of binoculars. It has six characteristics that single it out. First, it has an obvious crest; second, it has a black face mask through the eye (like a raccoon); third, it has a bright yellow tail tip; fourth, it has a small bright red spot its wing edges; fifth, it has a “soft” look to it; sixth, it makes a distinctive thin lispy zee sound. Males and females are the same. Somebody once described it as one big field mark. The small waxy wing tips on the secondaries (shorter wing feathers) give the bird its name. To early ornithologists, these wing markings reminded them of the wax used to seal envelopes (we lick ours today) for mailing. The heavily striped young are quite different without the red, but can still be easily identified by their crest and yellow tail tips. The older juveniles usually sport the black mask, also. 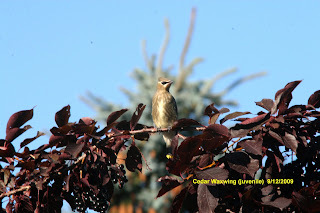 This week’s photos show an adult and juvenile in a chokecherry tree. The juvenile is eyeing some berries just to its lower right. It did eat some later on. 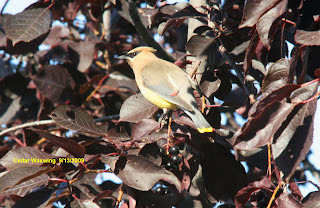 At the moment, Cedar Waxwings are all over town and could easily be in any yard at any given time. Because nesting is over and because the adults do not change colour during fall molt, this is the best time of year to observe them. This is an easy one.